Reading books is a great way to celebrate special days and holidays with young children. 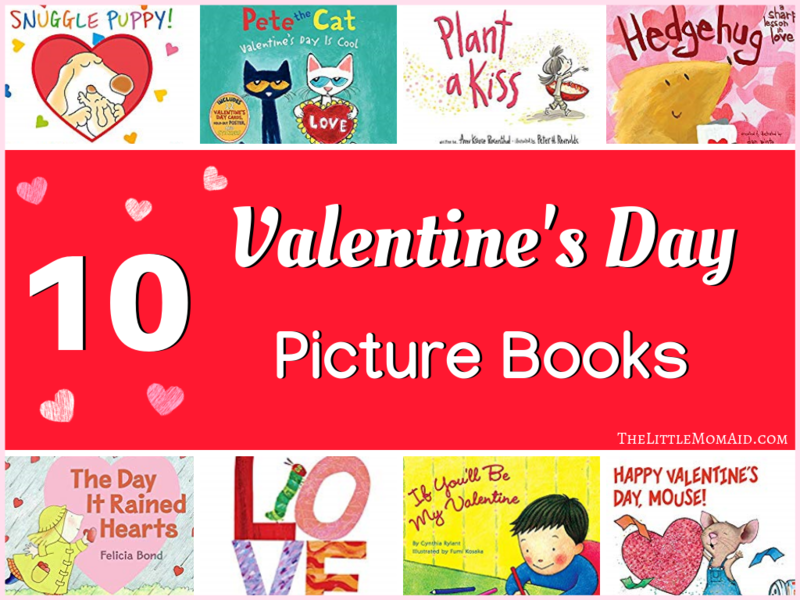 These 10 Valentine’s Day picture books are perfect for adding a little fun while helping children develop a love of reading and books, and developing early literacy skills. These Valentine’s Day books are both delightful and educational! This post contains affiliate links. Please see my Disclosure Page here for more details. This is a sweet story about a young girl who plants a kiss in the ground. This simple story demonstrates a little love and kindness goes a long way! The young girl watches her kiss grow and blossom and she shares the love with everyone around her. A sweet little book about the caterpillar from the well-known The Very Hungry Caterpillar book. Caterpillar shares different ways to tell someone you care and love them. Pete thinks Valentine’s Day is uncool until his friend Callie tells him that it is. Pete learns that Valentine’s Day is about showing those around you that you care and that you are grateful for them. One special day hearts rained down from the sky and Cornelia Augusta used some hearts to create special valentines for her friends. This darling book will give kids ideas on ways to create valentines for the special people in their lives! This would make for a fun read aloud before creating Valentine’s Day crafts! This is a cute story about a little boy who shares what he will do for each of his valentines – from his family to his pet dog! A sweet story about a little hedgehog eager to find love on Valentine’s Day. Finding love, however, is not as easy as he expected it to be. He finds himself in some rather prickly situations! Monster is from Cutesville and he is surrounded by cuteness! He does not feel cute and does not quite fit in. He decides to set off in search of friendship and love. He searches and searches and just when he is about to throw in the towel, he finds what he is looking for. This delightful and clever book is about a slug named Marylou who loves Herbie but is too shy to tell him aloud. She leaves him love poems throughout the garden. Herbie writes poems for her in return though something happens that prevents her from seeing them. Will they ever meet? Mouse is making valentines for each of his friends and he wants them to be perfect. Mouse creates valentines that are personalized and show what is special about each of his friends. This adorable book is about a mother dog telling her puppy how much she loves him. A sweet story that can be read for Valentine’s Day or really any day of the year! Happy Reading and Happy Valentine’ Day!